Some great information on camping in US National Parks – I didn’t know they even had “fee free” days and one of them, MLK, Jr., has passed. But there’s more in 2014, so if you are thinking of going, now’s the time! I don’t know if Doc Holliday ever actually said that, but it sure was cool coming out of Val Kilmer’s mouth in “Tombstone” – the 1993 hit movie. The town of Tombstone has the motto “The town too tough to die.” Well, maybe. A lot of people died of “unnatural” causes in Tombstone between 1879 and about 1889. So yes, it was tough, but not really all that much worse than Dodge City or Deadwood or Abilene or a hundred other boom towns that sprung up all over the west in the later half of the 19th century. In reality, the town didn’t die mainly due to luck and timing. After the silver mine that supported the town went south, it should have become a ghost town. That didn’t happen because it was the County Seat of Cochise County. The courthouse and other places important to the County were there. That changed in 1929, when the County Seat was moved to Bisbee, but by that time people were starting to find out about Wyatt Earp, Doc Holiday, and the famous gunfight at the OK Corral. So bottom line, Hollywood movies and “tell all” books started to capitalize on the Wyatt Earp legend just in time for Tombstone. I may sound a little cynical about this, but let me be clear. This was a great thing, because we still have Tombstone, and it is a gem. Yeah, there is a lot of tourist kitsch, and almost everything worth seeing costs money. There are a few places that were partially ruined because they were “fixed” in a way that wiped out some original details. I don’t care about those flaws, because so much still exists. More of the 19th century remains here than anywhere else I’ve been. 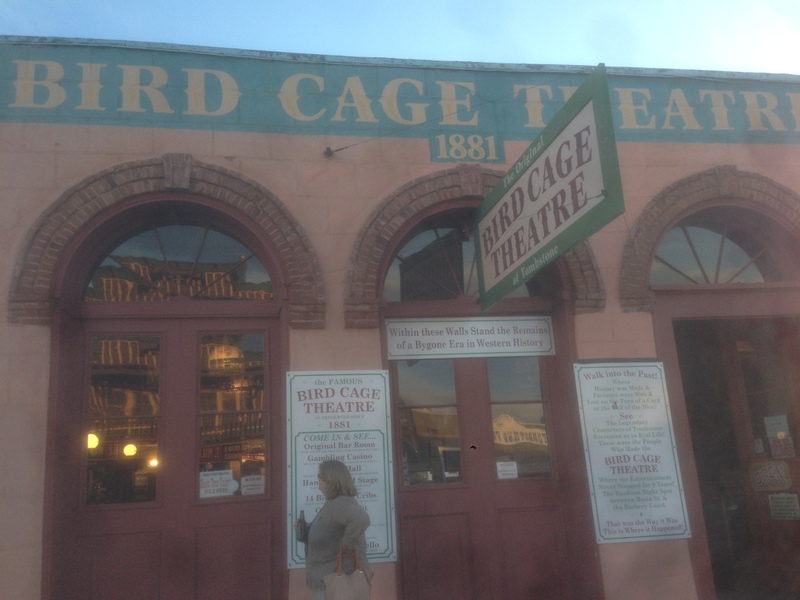 One of the most interesting places in Tombstone is the Birdcage Theater. This place was really infamous. It was a combination burlesque theater, brothel, bar, and gambling hall. It’s been said that there are over 120 bullet holes in the walls and ceilings of the Birdcage. It was open 24/7 for most of its heyday. There was a poker game that went on in the basement, non stop, for over eight years! Some very famous people from the 1880s played in this game, and we aren’t talking just Tombstone locals. Examples would be George Hearst and Diamond Jim Brady, along with locals like Doc Holliday and Earp pal Bat Masterson. The Birdcage Theater shut it’s doors in about 1889, and was sealed up until 1934. As a result, the contents of the building were virtually untouched during that time. When the people who bought the building in 1934 saw this, they decided to turn it into a museum. Items that are in the Birdcage Theater include the pool table that Morgan Earp was shot by (complete with blood stains), and the Faro table that Doc Holliday used as a dealer. The basement room that the long-running Poker Game was held in is still intact, as are the booths above the theater where “soiled doves” entertained their johns. 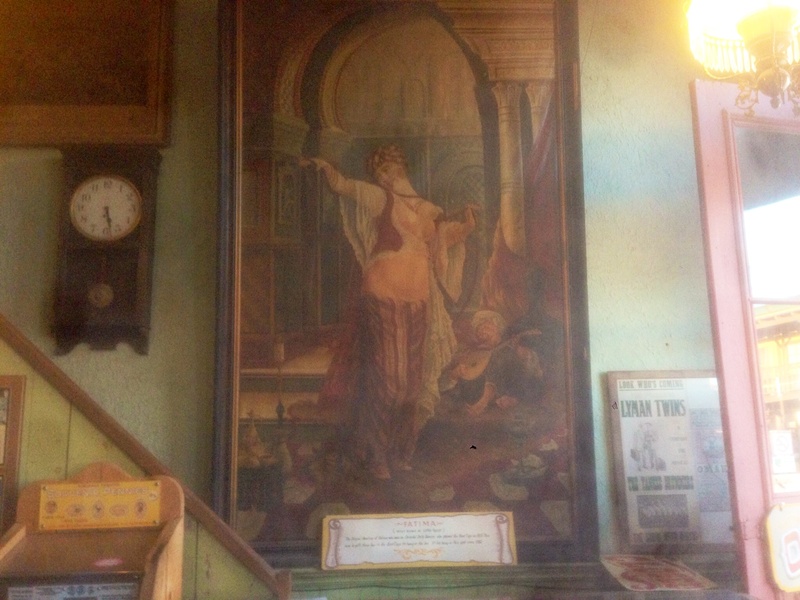 The lobby has the original bar, and a famous painting of Fatima, a belly dancer. I’ve seen the painting in several books. It was really cool to see the original. 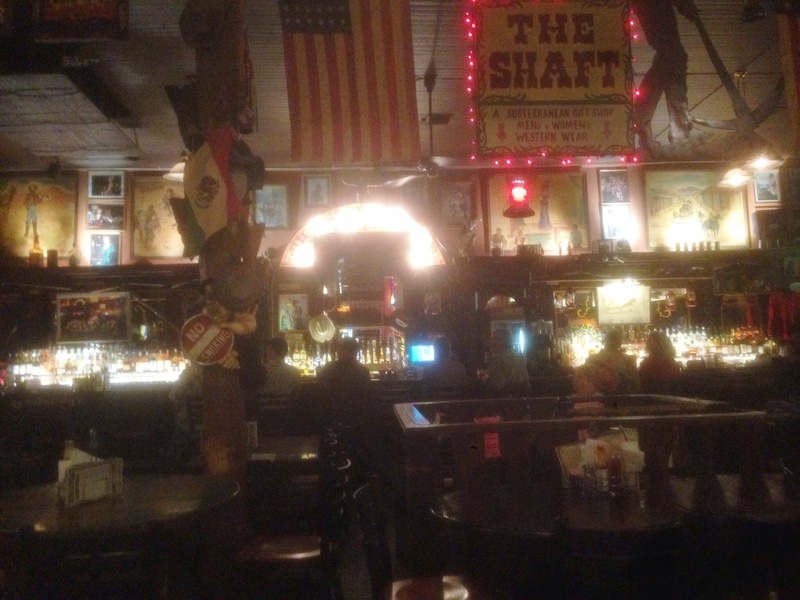 Big Nose Kate’s Saloon was another fun place. The building used to be the Grand Hotel, but it was damaged by fire during its heyday. It was repaired and re-purposed as a saloon with a gift shop called “The Shaft” in the basement, which you reach via a spiral staircase in the middle of the first floor room. You can still see some of the charred beams left as is after the fire. 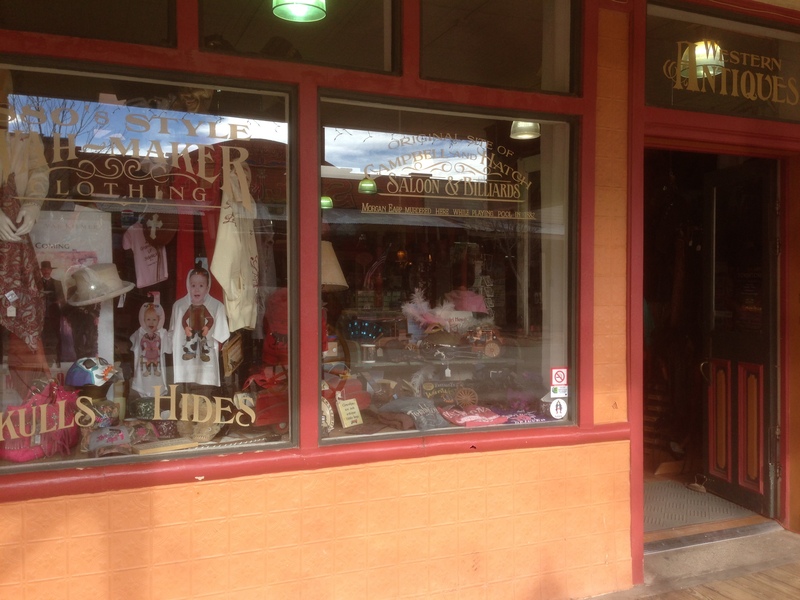 This place is a mixture of historic items and tourist kitsch, but it is great fun. It appeared to me that locals hang out here more than some of the other places. The bar is very long, and original to the building, although it has been moved. It used to be in the basement of the Hotel, and most of the famous locals of the 1880s have bellied up to it, including the Earps, the Clantons, the McLaury’s, Doc Holliday, and Curly Bill. When members of the “Cowboy” faction came into town, they generally stayed in the Grand Hotel. I enjoyed sitting at the bar. Food and drink are good at this saloon. I had a Reuben sandwich that the waiter said was “the best in the state” – and I believe it. Gobs of really good sliced corned beef. Laura had the Beef Brisket, which she said was very good. There is a very good IPA on tap. Laura doesn’t like beer, but she had a Sarsaparilla, which is very much like Root Beer. I’ll be back to Big Nose Kate’s. 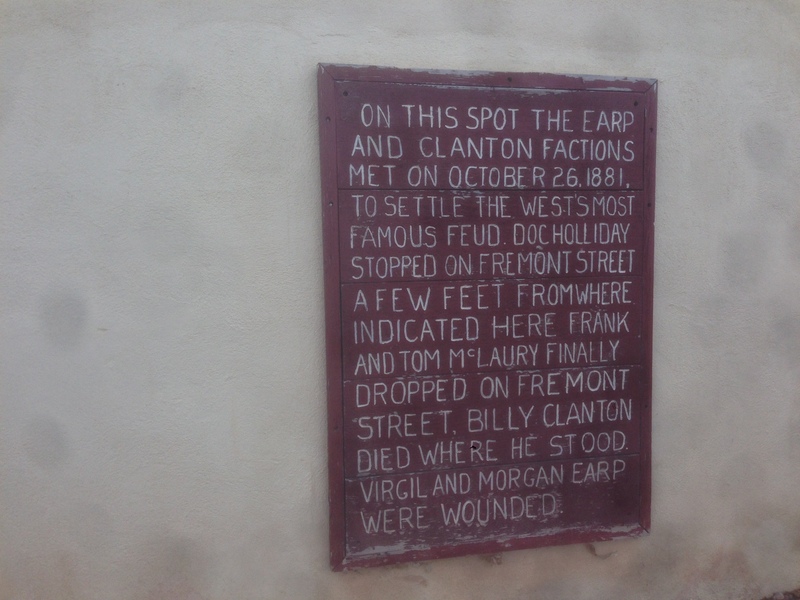 The OK Corral is said to be the site of the famous battle between the Earp faction and the Cowboy faction, on October 26th, 1881. 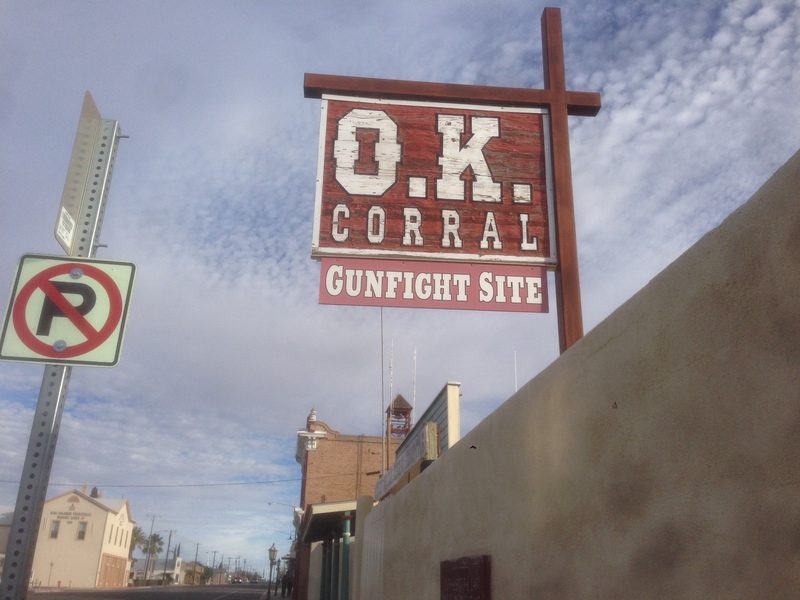 In reality, the fight happened in a vacant lot next to the OK Corral, and on Fremont street, which is just behind it. You can freely walk to the actual site. It’s not behind any walls, and there is a plaque on the wall, along Fremont Street. The OK Corral is behind walls, and you have to pay to see it. There are reenactment shows of the battle done there several times daily. We got there too late in the day to see that, but when we go back someday, we’ll pay the fee to go in. There are some artifacts here that would be worth seeing. 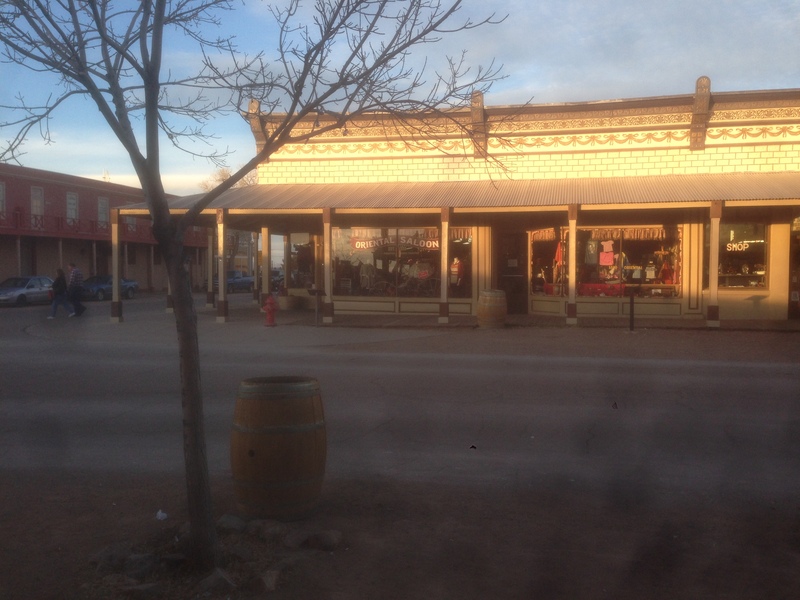 The Campbell and Hatch Saloon and Billiard hall was the site where Morgan Earp was mortally shot. It’s now a Gift Shop, but it’s clearly marked. Not a lot to see there, though. There were several other places there that we didn’t have time to see. The Oriental Saloon is one. If you’ve seen the 1993 film, this is the place where Wyatt Earp dealt Faro after taking the table away from a hot head (played by Billy Bob Thornton). Another was the courthouse – a stately looking brick building that is open for tours. The Longhorn Restaurant is in the building that used to house the Bucket of Blood saloon, another must see place which claims to be the longest continuously running restaurant in Arizona. There is also the Crystal Palace saloon, which was originally the Golden Eagle Brewery. This stop on our car tour was right at the tail end, and both Laura and I were antsy to get home, so we only spent the afternoon and evening there. Then we drove all the way home to Redondo Beach, CA. It was a very long drive. 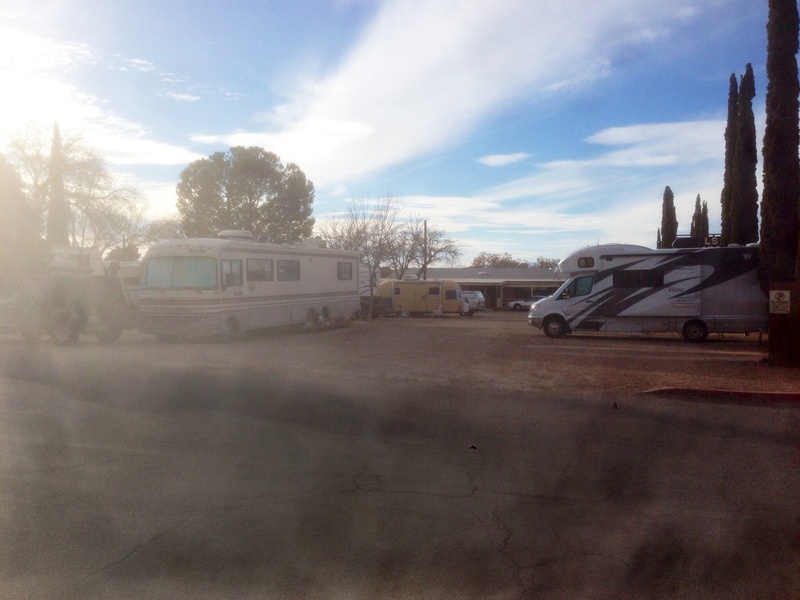 There is a small RV park right in the old part of town, so we plan to go back after we get our RV and stay there several days. You know a place is interesting when it leaves something behind in you. Tombstone is one of those places for me. Can’t wait to get back. After 20 days gone, we really mean it! Our last stop was Tombstone (which Bob will more adequately post about our time there) and we were staying at one of our nicer places, the Landmark Lookout Lodge, a very cool pet-friendly place on the outskirts of town. We had a view of the expansive desert, it was peaceful and they even had a cooked-to-order breakfast which was actually the best free breakfast we had on the trip. We had the option of staying an additional night, and it was very nice, and we could have done more or driven down to Bisbee and hung out with desert hippies, but we just couldn’t do it. Literally, we both knew we had to get home . . . no matter what. So the “Bataan death march” began as we got up early, watched the sunrise over the desert (wowza), ate that great breakfast and got the hell out of Dodge . . . er, Tombstone. It’s a long drive through Tucson and Phoenix and then into the sprawl that is Los Angeles, which starts at Riverside. Luckily, it was Martin Luther King, Jr. day which meant that some people were not working. Had it been any typical Monday, it might have taken even longer to get home. As it was, we made it home in good time. As Bob disgorged the car, I made a grocery trip, and then we just stared at the TV set all night. We stared at the TV because: (1) we were exhausted; and (2) we came home to a dead router, so no internet access – hey, welcome home! It’s been a long trip and I think it helped us clarify some things which we’ll write about more here. We also have a few trip reports to do which we’ll get to over the next few days. 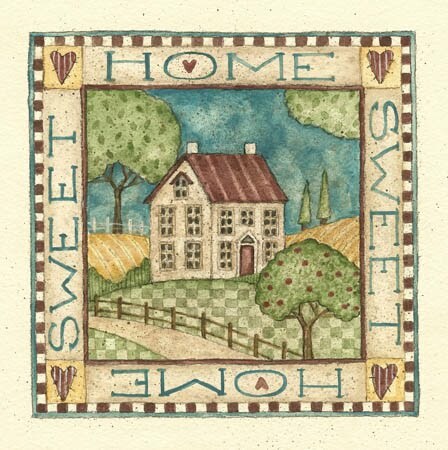 Yes, it’s good to be home. Not much to say today. We had to get from Fredericksburg, Texas to Las Cruces, New Mexico yesterday. It was about 7 hours! Texas is HUGE. The drive was quite charming, though. It was interesting to see the gradual transition in landscape from the Hill Country with it’s many trees and rolling hills, to West Texas, which is a lot flatter and very much a desert. We hit La Posta again, of course. Such a great Mexican restaurant. This time it was still light when we got there, so we took a little mini-tour of the old town of DeMesilla. It’s worth a few minutes to check out the old adobe buildings there. Now it’s on to Tombstone, Az. Ought to be fun!